Chefs Catalog, online at ChefsCatalog.com, is your headquarters for everything you need for the kitchen. There are pots and pans mixers, griddles, cookbooks, and cutlery on sale at Chefs Catalog. You can also buy specialty foods, silverware, dinnerware, glass beverage dispensers, batter dispensers, colander sets, and herb keepers at Chefs Catalog. In addition, Chefs Catalog sells measuring tools, aprons, kitchen towels, mitts, choppers, bar and wine accessories, jar openers, canisters, and coffee and tea presses. RetailSteal.com has the best Chefs Catalog coupon codes, Chefs Catalog discounts, Chefs Catalog coupons, and Chefs Catalog promo codes. Shipping and handling rates at Chefs Catalog depend on the price of your purchase and your shipping destination. See website for shipping charges. Save up to 80% off the sale section at Chefs Catalog. Click link to start shopping. At Chefs Catalog, get up to $70 off your online order of select Wusthoft Cutlery. Click link to buy now. Shop at Chefs Catalog and enjoy a free Chef'sChoice Professional Digital Scale with orders $249+. Click here to shop. 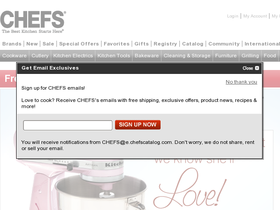 Shop at Chefs Catalog and enjoy $5 savings on orders $50+. Click here to shop. Shop at Chefs Catalog and enjoy $30 savings on Wusthof Classic Series Paring Knife. Click here to shop. Act now and take advantage of free shipping from Chefs Catalog on all orders $25+.